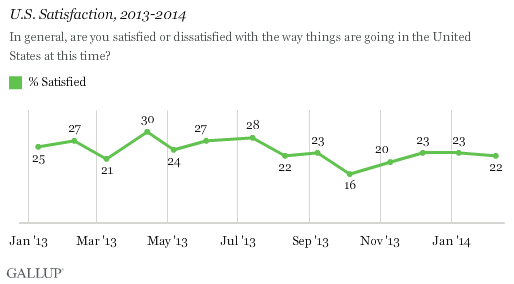 WASHINGTON, D.C. February 17, 2014 (Gallup Polls) — Americans have a new No. 1 problem. Nearly one in four Americans mention jobs and unemployment as the most important problem facing the country, up from 16% in January. The government and politicians had topped the list since the government shutdown in October. Prior to last fall, either jobs or the economy had led the “most important problem” list going back to February 2008, and these two have regained their top spots in the Feb. 6-9 poll. 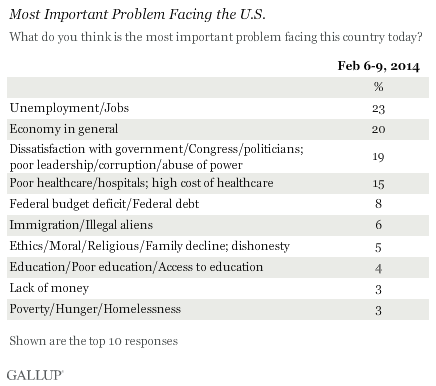 Healthcare continues to rank among the top problems, with 15% naming it, unchanged from January. Mentions of the federal debt/budget deficit are stable at 8%, despite Congress’ increasing the debt ceiling in February. Mentions of immigration increased slightly to 6% in February, compared with 3% in January. At least 3% of Americans mention ethics/moral issues, education, lack of money, and poverty. For Democrats, unemployment is clearly the top U.S. problem, with the economy, government dysfunction, and healthcare occupying a second tier of importance. Republicans place highest importance on unemployment and the economy, with healthcare and government in the third and fourth spots, respectively. Independents prioritize unemployment, government, and the economy, with healthcare a distant fourth. 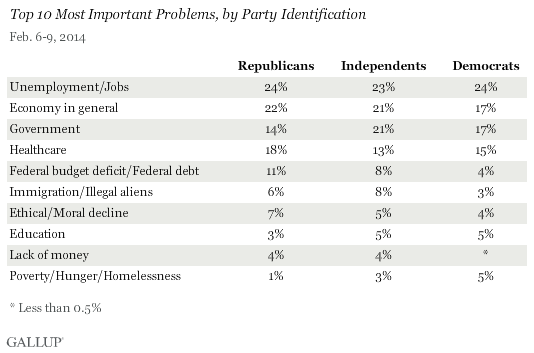 Immigration receives more mentions from independents than from Democrats, while the federal deficit is a greater priority for Republicans and independents than for Democrats. Mentions of unemployment and jobs as the most important problem increased among all three party groups this month. However, the jump was greatest among Republicans, to 24% from 11% in January. The 15% of Republicans mentioning the government is down significantly from 26% last month. Democrats and independents became less concerned with government as the most important problem in November and December after their worry spiked during the shutdown in October. Twenty-two percent of Americans are satisfied with the way things are going in the U.S., similar to the 23% found in December and January. This is up from the 12-month low of 16% in October during the government shutdown but is similar to the low numbers found in many other months last year. The all-time high on this measure in Gallup’s history was 60% in March 2003, while the low point was 7% in October 2008. 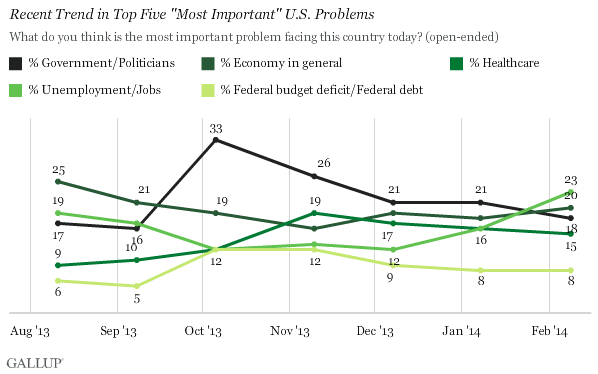 Economic issues again lead Gallup’s measure of what Americans see as the most important problem facing the nation. Concerns about the government, at least as measured by responses to this open-ended question, have faded since the government shutdown in October. Fears about employment and the economy may be linked to weaker-than-hoped-for jobs reports and flat job growth in the past few months. The rise in mentions of unemployment specifically may also be related to declining concerns about the government. In inverse fashion, mentions of unemployment decreased last fall as mentions of government dissatisfaction rose. Now that the shutdown is over and the government has successfully passed a budget and avoided another debt ceiling shutdown, Americans appear to have shifted their focus away from the government and back to the still relatively weak job market. Survey MethodsResults for this Gallup poll are based on telephone interviews conducted Feb. 6-9, 2014, on the Gallup Daily tracking survey, with a random sample of 1,023 adults, aged 18 and older, living in all 50 U.S. states and the District of Columbia.For results based on the total sample of national adults, the margin of sampling error is ±4 percentage points at the 95% confidence level.